Gratins are often laden with heavy cream and butter. This lightened version is just as delicious and wonderfully comforting. To serve with roast meats or poultry, omit the ham. Cut leeks in half lengthwise and wash well. Slice white and light green parts. In nonstick skillet, heat oil and butter over medium heat. Stir in leeks and garlic; cook until slightly softened, 3 to 5 minutes, stirring often. Remove from heat. Season with thyme, salt and pepper. Stir in mustard, stock and ham; set aside. Peel and thinly slice potatoes about 1/4-inch (5 mm) thick. 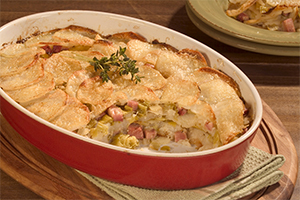 Place one-third in buttered 8- to 10-cup (2 to 2.5 L) gratin or shallow baking dish. Spoon half of the leek mixture over top. Repeat layers once. Top with remaining potatoes. Cover with buttered parchment paper, pressing buttered side down. Bake in 400°F (200°C) oven for 45 to 50 minutes or until potatoes are tender when pierced with a knife. Remove parchment paper. Sprinkle with cheese; bake for 15 minutes to melt cheese and lightly brown potatoes. Let stand for 10 minutes before serving. Tip: A mandolin or food processor makes even, thin potato slices. To make slicing easier, cut potatoes in half crosswise and place flat edge down on mandolin.